The buzz created when the Tampa Bay Lightning signed free agent forward Cory Conacher to a one-year contract earlier this summer has been hard to ignore, but a look at his life on and off the ice makes it easy to understand. The 26-year-old played just 35 games in a Lightning uniform during the 2012-13 season before being part of arguably the most important trade in Lightning history, but the reaction created by Lightning general manager Steve Yzerman’s decision to bring back Conacher is the sort of response reserved for players that have been with an organization for much longer. For Conacher, the hard road to the NHL and the course his professional career has taken since being traded by the Lightning in 2013 helps to put things into perspective and explains what makes him so endearing to hockey fans. Long before Conacher put on a Lightning uniform and skated in his first NHL game, he was beating the odds off the ice. Shortly after his birth in Burlington, Ontario – five days to be exact, Conacher underwent a 10-hour surgery to reconstruct his pelvis. The procedure was to address a rare birth defect, bladder exstrophy, in which he was born with his bladder outside of his body. The condition, which affects just one of approximately every 45,000 births, tested Conacher’s resiliency at a young age as he also underwent surgeries at ages three and five. At one point, Conacher’s legs were placed in traction after a procedure and had atrophied so much that doctors told his parents that he may not walk properly again. Despite these surgeries, Conacher now has a bladder that is just one-eighth the size of an average adult. At age 8, Conacher was diagnosed with Type I diabetes. He monitored his blood sugar level and gave himself insulin shots to help address his condition before undergoing a procedure at age 12 to have an insulin pump attached to a permanent port in his abdomen. Conacher, however, would not let his health conditions stop him from playing the game he loves. As an amateur hockey player in Ontario, Conacher was cut from the Burlington Eagles Minor AAA bantam team and sent down to the club’s AA team because of the coaches concerns about Conacher’s size and diabetic condition. Conacher used the experience as motivation to succeed. After playing a season with the Ontario Provincial Junior Hockey League’s (OPJHL) Burlington Cougars and scoring 22 goals and 62 points in 48 games, Conacher was passed over by every team in the Ontario Hockey League’s (OHL) draft. Conacher received a hockey scholarship to Canisius College, a small private school in Buffalo, NY, just over an hour’s drive from his home in Ontario. This gave Conacher the opportunity to play Division I college hockey in the Atlantic Hockey Association (AHA), while also remaining close to his family who had helped him through so much at that point in his young life. In his freshman year with the Golden Griffins, Conacher suffered a broken arm limiting him to just 20 games. Despite his shortened season, Conacher registered seven goals and 17 points. Conacher’s college hockey career spanned four seasons and he left his mark on the school’s hockey program in 129 games. He set team records in goals (62), assists (85), points (147) and game-winning goals (12) while also receiving numerous accolades. In the 2009-10 campaign, Conacher tallied 20 goals and 53 points in 35 games before being named the AHA Player of the Year and a member of the All-Atlantic Hockey’s first team. He followed the next season by being named a member of the All-Atlantic Hockey’s second team and a First Team Lowe’s Senior CLASS All-American. Even Conacher’s success at the college level was not enough to convince an NHL team to draft the small forward. At the end of his college hockey career, the undrafted free agent spent the 2010-11 season with three different professional teams. In two games with the Rochester Americans of the American Hockey League (AHL), Conacher scored one goal. Despite registering five goals and seven points in three games with the Cincinnati Cyclones of the ECHL, he finished the season with the AHL’s Milwaukee Admirals and compiled three goals and five points in five games. 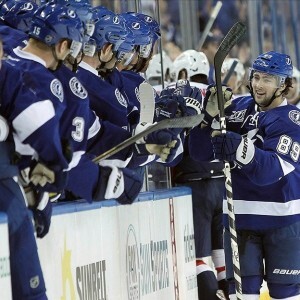 On July 6, 2011, Conacher signed a one-year deal with the Lightning’s AHL affiliate, the Norfolk Admirals. As a rookie during the 2011-12 season, Conacher scored 39 goals and 80 points in 75 regular season games before registering 15 points in 18 playoff games and helping the Admirals to the team’s first Calder Cup. Conacher received the Les Cunningham Award (as the AHL’s most valuable player) and Dudley “Red” Garrett Memorial Award (top rookie) while also being named to the AHL’s All-Rookie Team and the AHL’s Second All-Star Team. Conacher started the 2012-13 regular season with the Syracuse Crunch (after the Admirals moved to Syracuse during the 2012 off-season) and compiled 28 points in 36 games before being invited to the Lightning’s training camp after the NHL lockout ended and the shortened season was set to begin. Conacher made the club out of camp and quickly made an impact at the NHL level. In 35 games, he registered nine goals and 24 points. The 5’8″, 180-pound speedy forward reminded many observers of a young Martin St. Louis — one of the franchise’s most important players and an undersized forward that also went undrafted after a successful college career. Despite the promising start to his NHL career, Conacher, and a 2013 fourth-round draft pick were shipped to the Ottawa Senators in exchange for goaltender Ben Bishop on Apr. 4, 2013. While Bishop was largely unproven at the time, Yzerman saw an opportunity to acquire a potential franchise goaltender and doing so came at a price. Since being traded by the Lightning, Conacher’s hockey career has been a bit of a roller coaster for the talented forward. 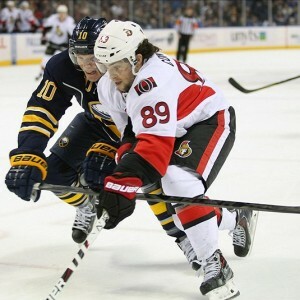 He played 72 regular season games with the Senators and registered six goals and 25 points before being placed on waivers by the club during the 2013-14 season. 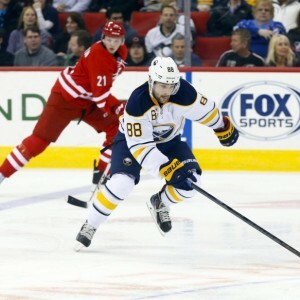 After being claimed by the Buffalo Sabres and scoring six points in 19 games, Conacher became an unrestricted free agent when the Sabres did not extend a qualifying offer to him at the end of the season. Conacher signed a one-year deal with the Islanders and appeared in just 15 games in 2014-15, before being placed on waivers and later sent to the AHL’s Bridgeport Sound Tigers where he tallied 23 points in 28 games. On Mar. 2, 2015, Conacher was traded to the Vancouver Canucks and assigned to the AHL’s Utica Comets. In 20 regular season games with the Comets, he compiled 16 points and helped the team to the Calder Cup Final by adding eight points in 23 playoff games. At the conclusion of the 2015 season, Conacher signed a two-year contract with SC Bern of the National League A, Switzerland’s highest level professional league. In 48 games during the 2015-16 regular season, Conacher registered 22 goals and 52 points before helping Bern to the National League A title. The championship season capped a successful year for Conacher, as he had also been a member of Canada’s gold-medal winning team at the Spengler Cup in December. While Conacher’s immediate future with the Lightning remains to be seen, Yzerman’s decision to bring him back shows that he has monitored Conacher’s progress as a player since trading him away and a potential role for Conacher with the club moving forward. For the Lightning, Conacher is a familiar face that has had earlier success with some of his new teammates at the AHL level. Current coach Jon Cooper was behind the Admirals’ bench during the 2011-12 Calder Cup season while Conacher played alongside current Lightning forwards Tyler Johnson, Alex Killorn and Ondrej Palat. In addition, Conacher also fits the mold of the organization’s culture off the ice, as he is heavily involved in diabetes-related awareness work with young kids. When training camp opens in September, Conacher will be challenged to establish himself given the depth of the Lightning’s current roster. If Conacher’s past is any indication of the future, do not count him out. After all, the odds have never stopped him before.